The Alfa Laval Multi-Effect Plate (MEP) evaporator is used, among other places, on cruise vessels and at diesel power plants to produce the highest quality fresh water at the lowest possible overall production costs. Supplying high quality fresh water to meet the demands on board the fleets of the world and at diesel power plants is a challenge that must be addressed in order to support sustainable development. To meet the growing demand for potable and technical water, it is important to be able to provide economical and efficient desalination technologies. The Alfa Laval MEP system is an easy-to-use fresh water distiller that uses seawater to produce the highest quality distillate with conductivity of less than 20 μS/cm at the lowest possible overall production cost. 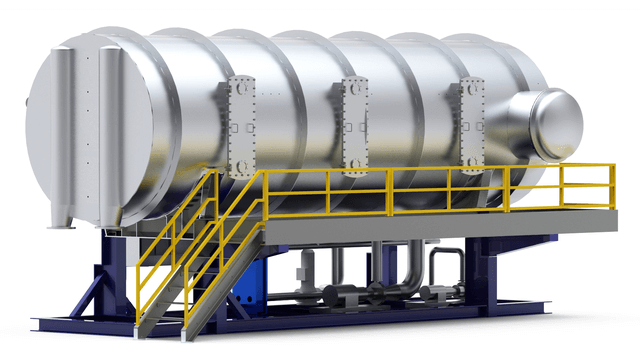 Economical and highly efficient, the MEP employs combined plate-type evaporator/condenser effects to produce fresh water using the available waste heat from hot water or low-pressure steam, or a combination of both. The self-contained automated MEP evaporator is designed with very high thermal efficiency for high production rates using very little waste heat. Furthermore, the electric energy consumption is kept to a minimum through the use of an optimized pump configuration and the application of frequency controlled motor on the sea water pump. With its modular design, this highly reliable MEP evaporator is easy to configure to the requirements of any vessel, diesel power plant. Straightforward operation and automated control provides maximum uptime at less cost compared to technologies such as reverse osmosis (RO) and multi-stage flash (MSF). Its lightweight, space-saving design takes up less floor space while offering much higher thermal efficiency in relation to its volume and weight compared to other evaporators. This enables the production of much higher volumes of fresh water than other desalination technologies. The MEP system offers the lowest possible consumption of both electric energy and chemicals. The electric energy consumption of the four-effect MEP-4-750 desalination unit, for example, is less than 2.5 kWh/m³. Moreover, the MEP does not require brine circulation or any anti-foam injection, and its total anti-scale chemical consumption is less than traditional multi-stage flash units. The Alfa Laval MEP desalination process consists of a series of evaporation and condensation chambers known as effects (2). Each effect is fitted with heat transfer surfaces based on patented Alfa Laval plates. In the plate channels of an effect, seawater on one side is heated up and partially evaporated to distillate vapour, which is used in the next effect; on the other side, the distillate vapour from the previous effect is condensed, giving up its latent heat, into pure distillate. By maintaining a partial pressure difference across the effects, the process is able to yield maximum efficiency from available low-grade thermal energy sources. The performance and the capitalcost of the system are proportional to the number of effects contained in a unit. Seawater is pumped into the system via a seawater pump (8) to a condenser (1). Here, the seawater acts as a coolant, removing the heat supplied to the system and thereby maintaining the proper energy balance. In the condenser, the vapour produced in the last effect is condensed into pure distillate. As distillate vapour is condensed, heat is transferred to the seawater. The seawater pump (8) also transports preheated seawater downstream of the condenser to the various effects (2) of the unit for evaporation. The seawater is led towards the evaporation side of the plate stack, creating a uniform and controlled thin film on the plate. To minimize scaling, the special design of the plate surfaces ensures a uniform flow without any dry areas. On the evaporation side of the plate stack, the seawater is partially evaporated by the heat from the condensation side of the plate stack. The vapour thus produced is passed through a demister to separate salt from the water droplets before the vapour enters the condensation side of the subsequent heat exchanger plates. Here, the vapour condenses into distilled water while transferring its latent heat through the plates to the evaporation side. The process is repeated in all effects. Finally, distillate and brine are extracted from the last effect. The evaporation takes place at sub-atmospheric conditions, and vacuum conditions are created and maintained by a venting system. The venting system is a water-driven ejector (5 and 6), as shown on the flow diagram. The venting system removes air from the plant at start-up and extracts non condensable gases during operation of the plant.